Mount Shasta received a late summer dusting of snow. More than a week into the Delta Fire, the firefighting effort has really turned a corner on containing the beast. Officially, the fire is at 17% containment. 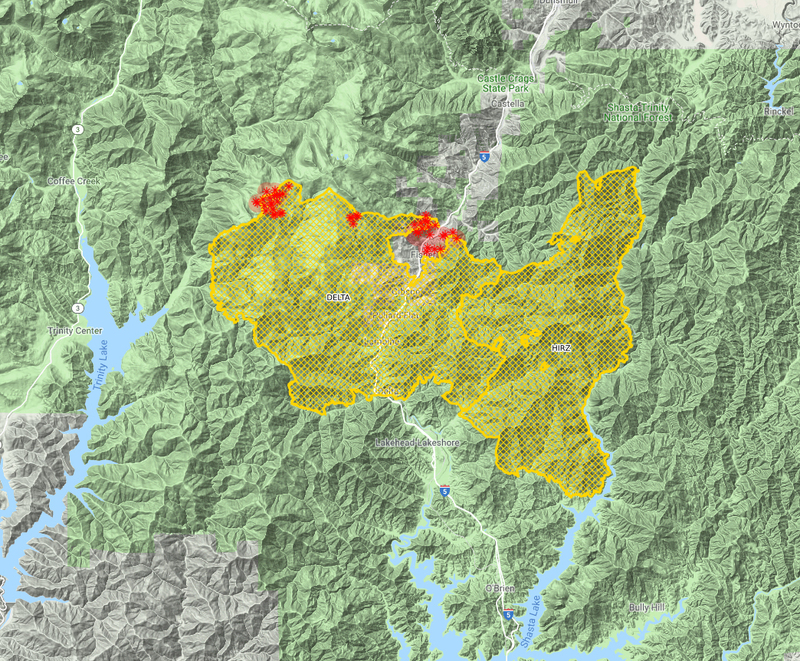 While it has grown 58,427 acres, it has not jumped any fire lines and the areas that have been burned recently were within the projected fire lines. Not only has the pace of containment accelerated, the growth of the fire has decelerated. This is largely the result of cooler temperatures and even a little precipitation. Though there is no more rain in the immediate forecast, what little we did get was a huge blessing. It suppressed fire activity and allowed firefighters to really advance the containment lines. 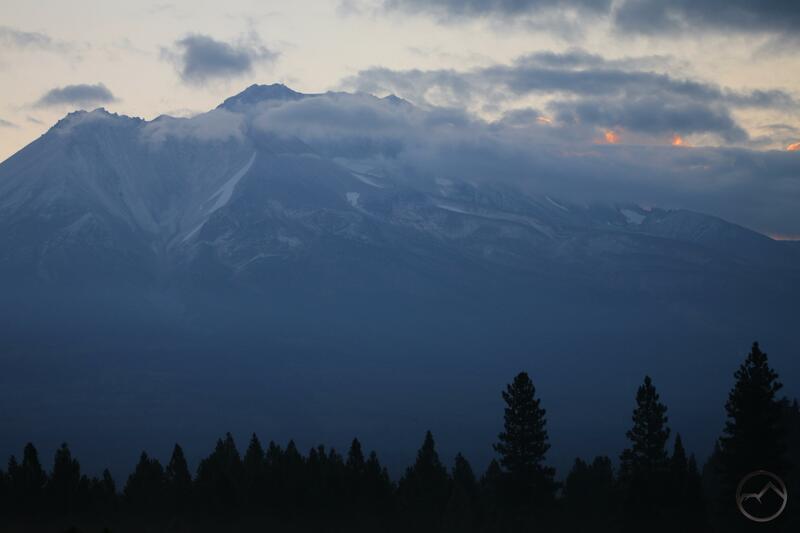 As a welcome harbinger of these successes, Mount Shasta even got a light dusting of snow during the night! 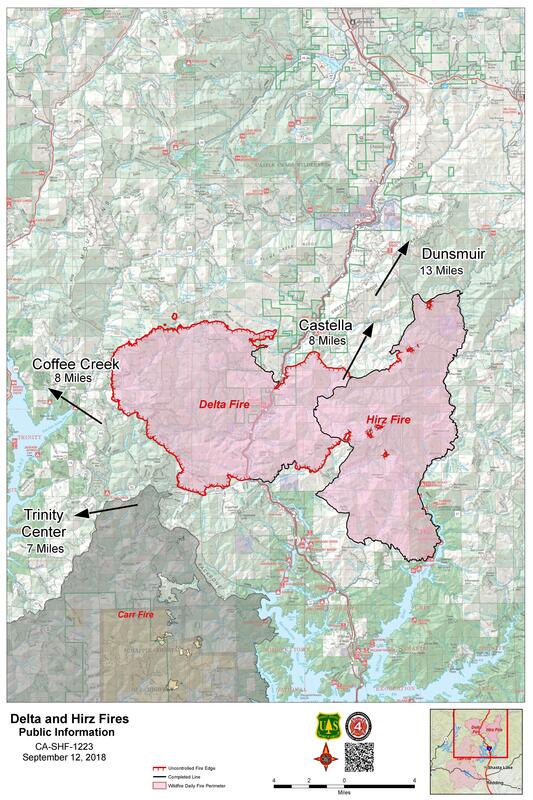 The Delta and Hirz Fires as of September 12. Though the Delta Fire is officially larger than the adjacent Hirz, the two have completely merged together, forming a single block of burned terrain that is over 100,000 acres. The Hirz is 100% contained, so its containment lines help hold back the Delta Fire and have allowed firefighters to deploy resources in more pressing places. This has also been true on the south, where contingency lines built to hold back the Carr Fire, should the fire have jumped the main containment line, were also critical in holding the Delta Fire back from a southward advance. The really encouraging work has taken place on the north side of the fire. Not only was the Highland Springs community saved, but the containment lines further north have been constructed. This means that the Tamarack Lake Basin is likely to be saved. As an added bonus, the rarely visited Highland Lakes, Pond Lily Lake and even possibly the Grouse Lake basins will all be outside the fire’s ultimate boundary. This also means the Grey Rocks, some of the most rugged and enigmatic peaks in the region will not be burnt over as well. This is great news for hikers, explorers and lovers of the natural world. Also, it means that the communities further up the Sacramento River Canyon are not going to be threatened by the fire. Progress is also being made on the west side of the fire. Some of the Carr Fire’s contingency lines are in use The terrain here is steep and rocky in some places. Lately, it has been the focus of consistent aerial attack. Fire lines have also been under construction as well. This area is critical, since there are some residences and even an extensive vineyard here along the East Fork of the Trinity River. While this area is still threatening, it is not as urgently dangerous as it was a week ago. Progress is definitely being made. Even though the low temperatures of the last few days and nights are not going to be sustained, the daily highs will only reach into the 70’s, meaning there are better conditions for fighting the fires. The good conditions and increasing containment mean that the worst of the Delta Fire is likely in the past and we can hopefully look forward to a pleasant end to the summer months and a beautiful fall. Let us pray the fires are left behind as well. Without even knowing the fire had kicked up again and that I-5 was closed, it was obvious here in Mount Shasta that something was afoot. After good air quality over the last few days, the smoke rolled back into town in a big way. No doubt this is the result in the fire getting more active again. 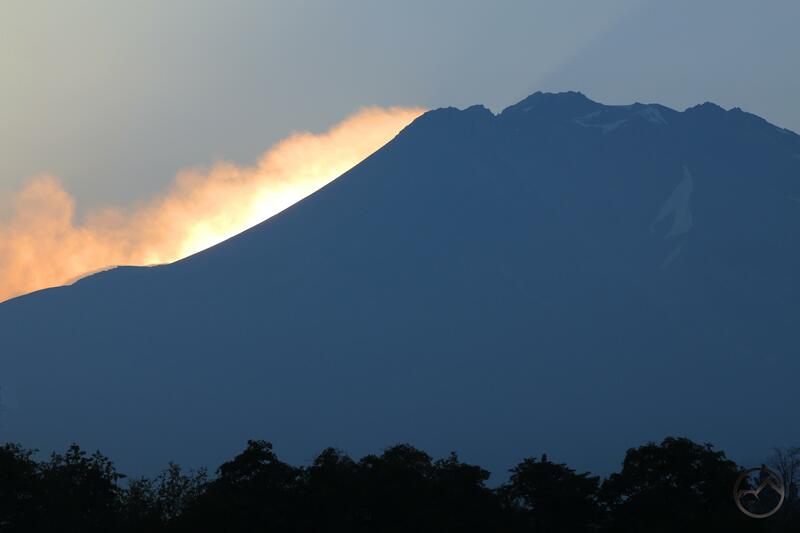 Thankfully, despite the seriousness of the flare up, it is a pretty localized event. Hopefully they will be able to put a lid on it pretty quick. The smoke it back yet again. Hopefully it will blow out soon. 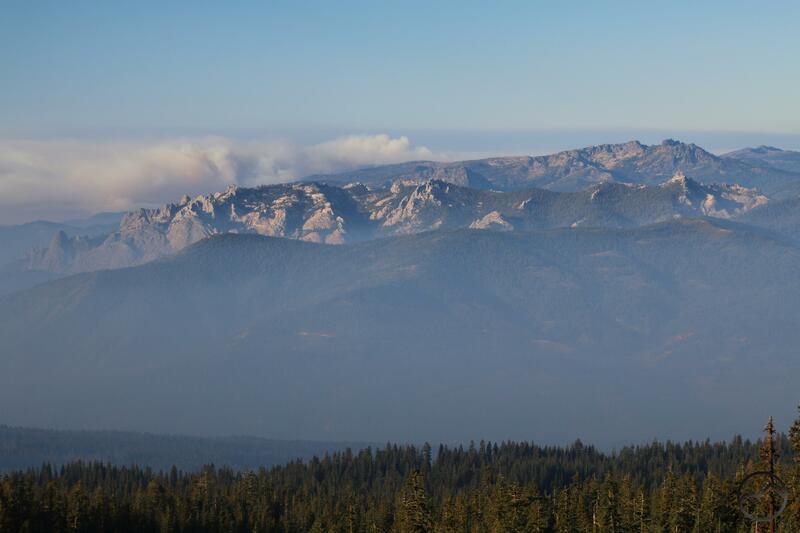 The Delta fire burns south of Flume Creek Ridge, the Castle Crags, the Grey Rocks and Red Mountain. We have reached day 6 of the Delta Fire. 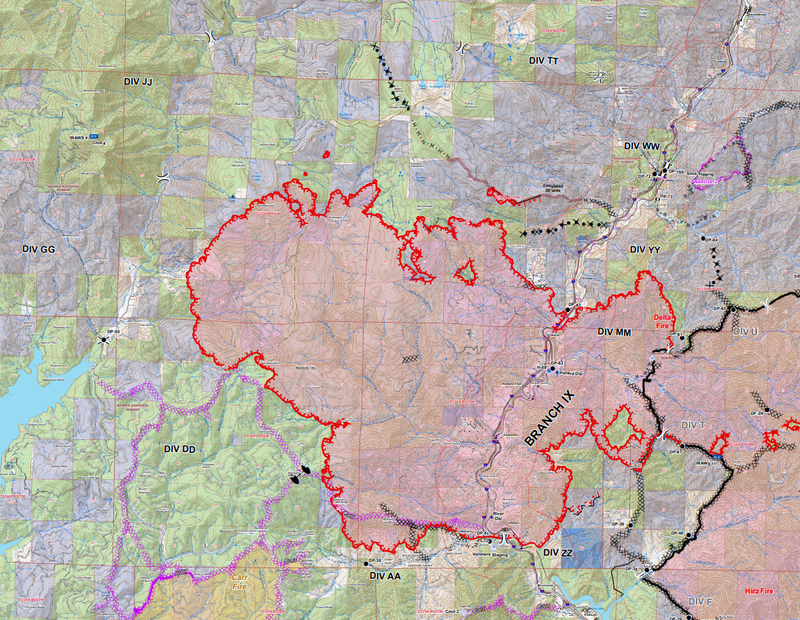 It has now grown to 47,110 acres, making it roughly 1,000 acres larger than the now-contiguous Hirz Fire. Fortunately the fire has continued a slow advance it is now officially at 5% containment. I believe that the functional containment is actually much higher, considering the use of contingency line left from the Carr and Hirz Fires as well as the burned out areas of the Hirz, where there is little fuel left for the Delta to expand into. Nonetheless, the northwest side of the fire remains uncontrolled and continues its slow but inexorable advance up the Slate Creek drainage. The smoke was awful yesterday but after the sun set the winds cleared it out in fairly swift fashion, leaving a night of clear stars. This morning was clear as well and, seeing some interesting clouds and minimal haze, I headed out to see what conditions were like. It made for a beautiful sunrise and lovely conditions up at the Old Ski Bowl. The good air quality at the Old Ski Bowl also meant I had a good opportunity to look south and observe the Delta Fire’s activity. The sky was haze free all the way to the plumes that were coming up from the northern part of the fire. All the smoke was blowing east. Strangely enough, though Red Mountain is right at the front line of one of the most active parts of the fire, the wind made it seem as though there was no smoke in that vicinity at all. 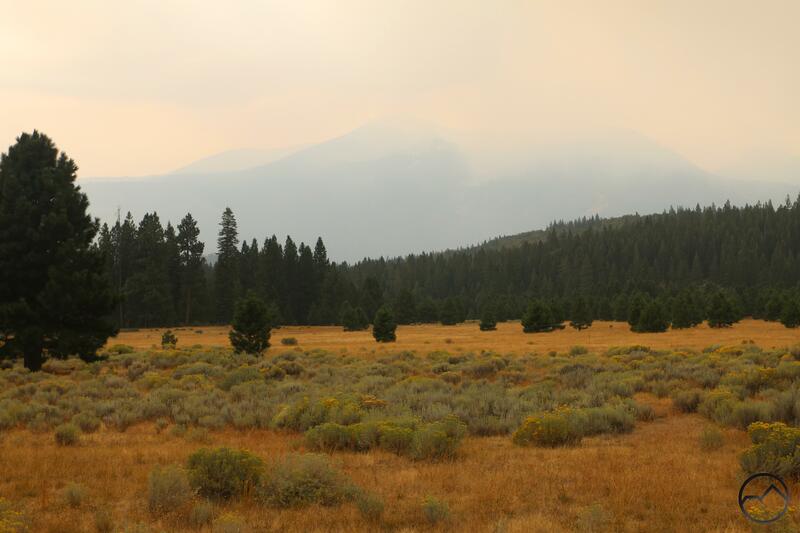 It also meant that the area burned by the Hirz Fire was totally blanketed in a deep layer of smoke. 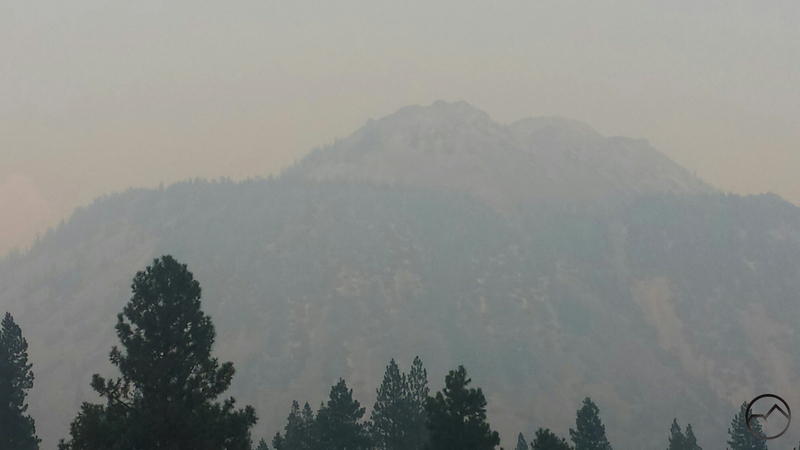 Tombstone Mountain rises above the smoke in the Hirz Fire area. This raises the question about what is going on with the Delta Fire at this time. Thankfully there are positive developments. First, as noted, there is some official containment of the fire, though the functional containment is probably significantly higher than the listed 5%. Anything is good at this point, though. Second, also as noted, the fire continues to advance but only slowly. Though it is troubling that it has reached the area around Red Mountain, I am hopeful that the rugged, rocky terrain will function as a natural fire line and keep the flames from advancing north and west from there. 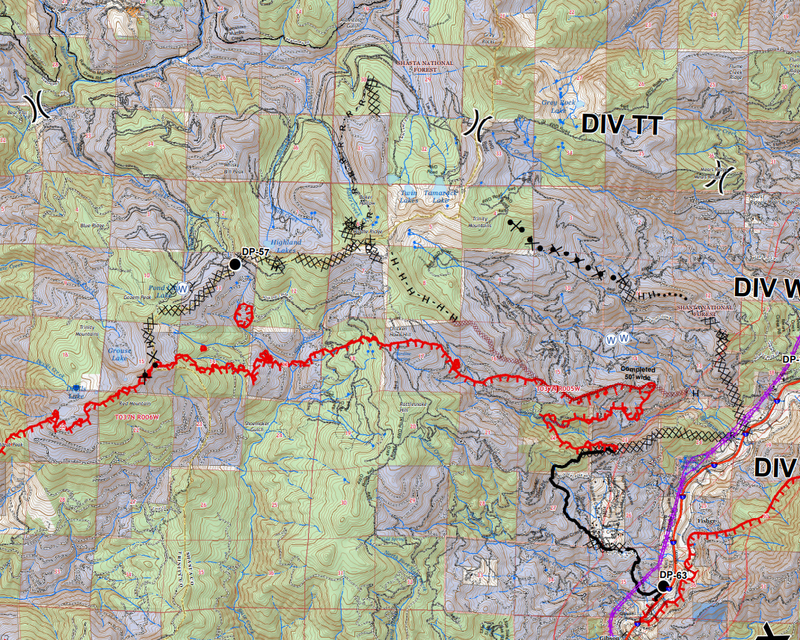 Note the line of ‘H’s’ extending north of the established fire line. This extends all the way to Baker Peak, which is one of the highest points along the ridge above Tamarack Lake. Also important is the indication of a bulldozer line being prepared (marked by X’s and dots) further north, in Baker Hollow. I am really glad to say that, if these lines hold, it is highly likely that the Tamarack Lake basin will be spared! I can’t express how relieved I am that this may even be a real possibility. 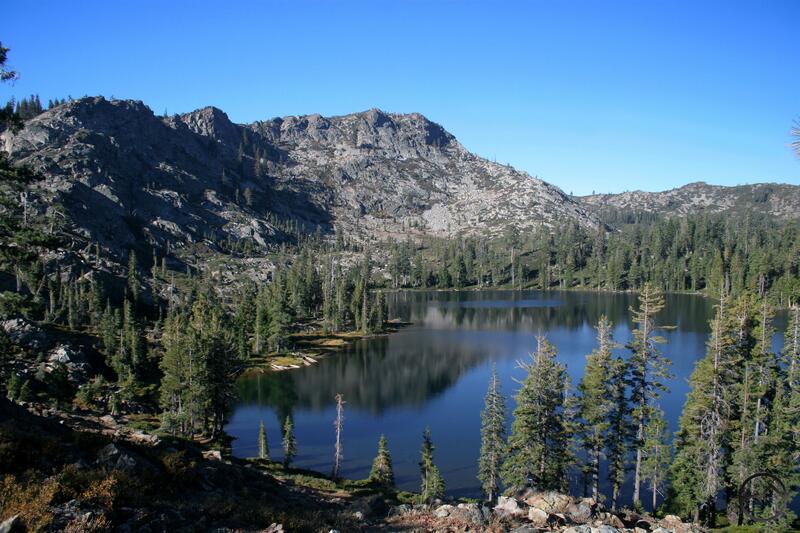 The Tamarack Lake Basin is one of the prettiest in the entire Klamath Mountains, with its rugged cliffs, gorgeous lakes, lush meadows and views of the craggy Grey Rocks all combining to make a very idyllic spot. While it is by no means guaranteed at this point, the fact that the line are being cut in in such a way that the fire might get saved is encouraging. On the east side of the fire, the flames have expanded on into the burned out area left from the Hirz Fire. Fortunately, the old fire lines and the burned areas will keep the fires in check. The most vulnerable area is the Hazel Creek watershed, which meets the Sacramento River at Sims. 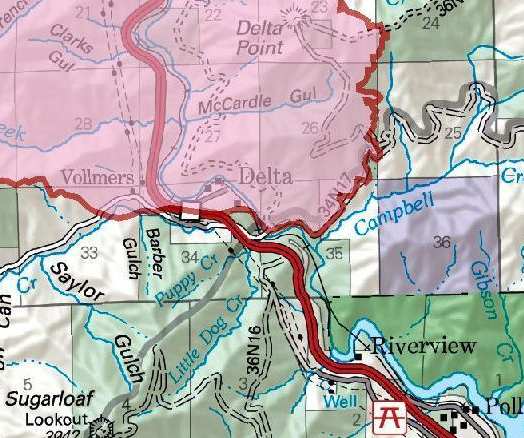 According to the above map, it does look as though containment lines are in place and under construction that will prevent the whole Hazel Creek drainage from going up in smoke. I am also encouraged that saving this area is even a possibility. I hope the efforts prove successful. It is worth noting that the Union Pacific has been running a firefighting train through the canyon, spraying down the trees along the tracks and helping prevent it from burning. This has also allowed them to maintain the rail corridor through the canyon. This idea is affirmed by the testimony of trains that continue to fly past my house. As far as I-5, it is now open one lane in each direction. In summary, the fire is still large, still advancing but significant gains have been made and some special places may be spared destruction. I hope this will be the case when it is all over. Now if we can just get some rain! Dawn view south toward the Delta Fire. With the Delta Fire still raging through the Slate Creek watershed and growing to a depressing 40,580 acres, I thought it might be helpful to look at some positive developments going on with containing the fire. 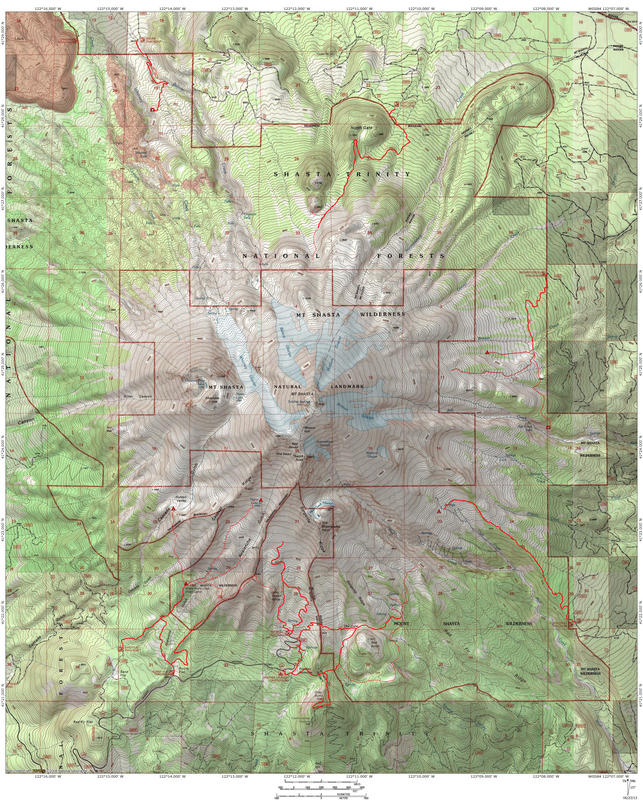 I want to admonish that all of what I have to say is from my own observation and interpretation of the maps. All the maps are available to the public, though some may be harder to ferret out. I apologize for any mistakes or misinterpretation of the data. That said, the first thing I want to point out is that though the fire continues to grow, its pace has slowed, giving the firefighters a window to get some assets in place and try to slow the advance. Looking at the fire on Thursday morning compared to this evening is a little reassuring. Obviously the fire is larger than we would like, but when I went to bed Wednesday night I was expecting things to be far worse on Thursday. Moreover, I figured the fire would have consumed Tamarack Lake by this point and moved further up the Sacramento River canyon as well. As of Saturday night, neither of those two things have happened yet. Both could still be lost to the fire but at least at this point there is a fighting chance to save them and hope yet remains. Another big blessing was the fact the the Delta Fire erupted in between the Hirz and Carr Fires. That meant that assets were close at hand and, just as important, many fire lines had already been cut. These were contingency lines to contain the Carr and Hirz if they jumped the lines that ultimately checked them. Nonetheless, they could swiftly be manned and brought into play to protect structures and unburned terrain. One good example of this was at Vollmers, where most of the homes seemed to have been saved. 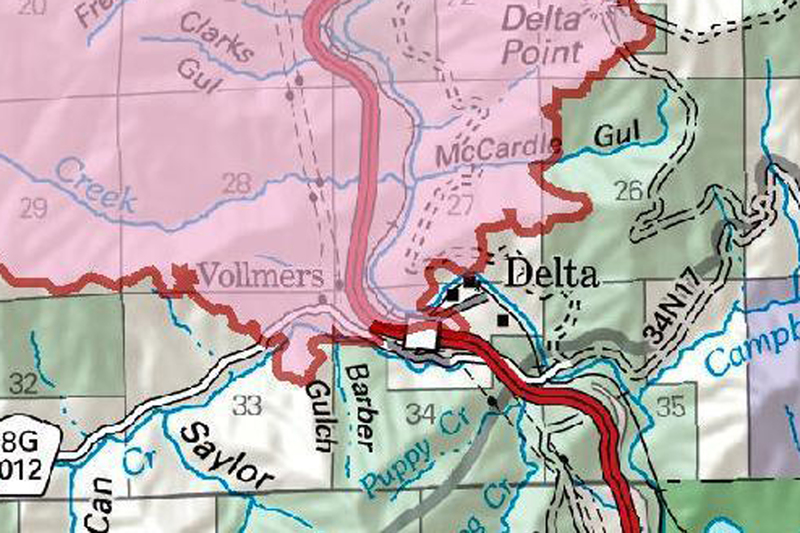 The contingency line for the Carr held the Delta Fire back. 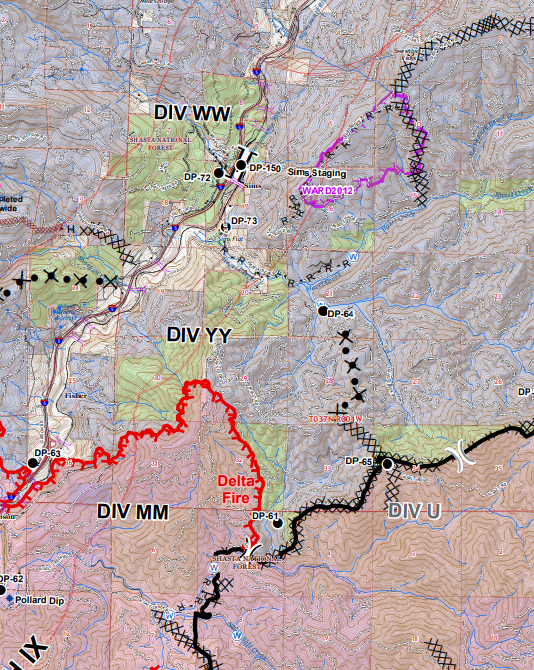 The purple ‘x’ line is a Carr Fire contingency line. 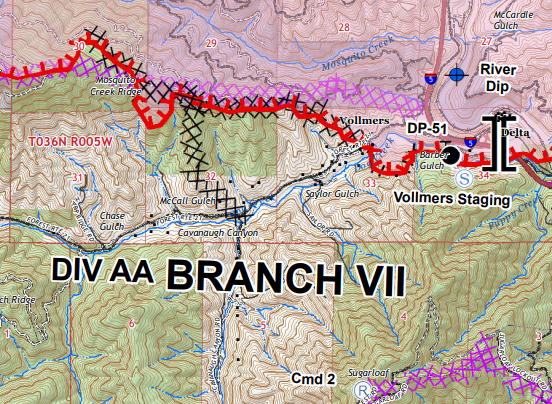 The black ‘x’ line is new fire line cut in to fight the Delta Fire. The lines at Vollmers have been strengthened but and most of the canyon is outside the fire’s perimeter. That would likely not be the case if the contingency lines were not already in place. 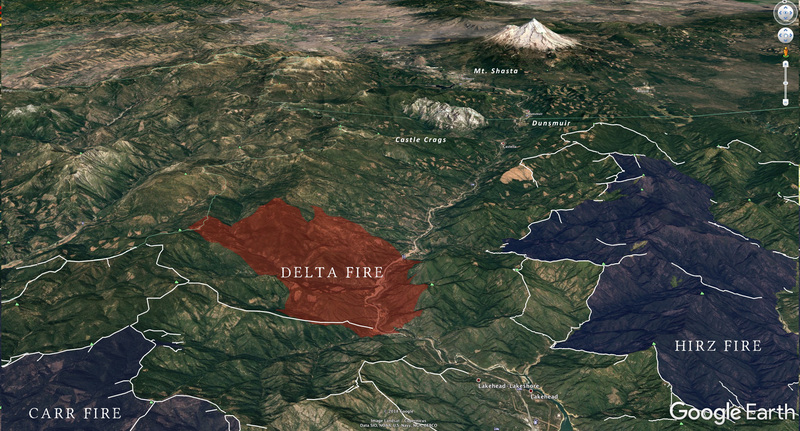 Unfortunately, the nearby hamlet of Delta has now fallen within the fire’s perimeter, where it had been excluded before. At this point, the fate of the homes is uncertain. Let’s hope they are still there. Delta now inside the fire’s lines. Another place where firefighters have made a valiant stand is to protect the homes in the secluded neighborhood of Highland Springs. This collection of houses lies in a hidden area on the west side of the canyon. A fire line was quickly cut in on the south side of the area and, thus far, has managed to hold the flames back. It isn’t exactly containment but it is a significant victory. Highland Springs if the light colored block above the black ‘x’ line, which notes a fire bulldozed fire line. The Highland Springs area is part of a really active firefighting area. This is the most critical part of the containment operation at this time. 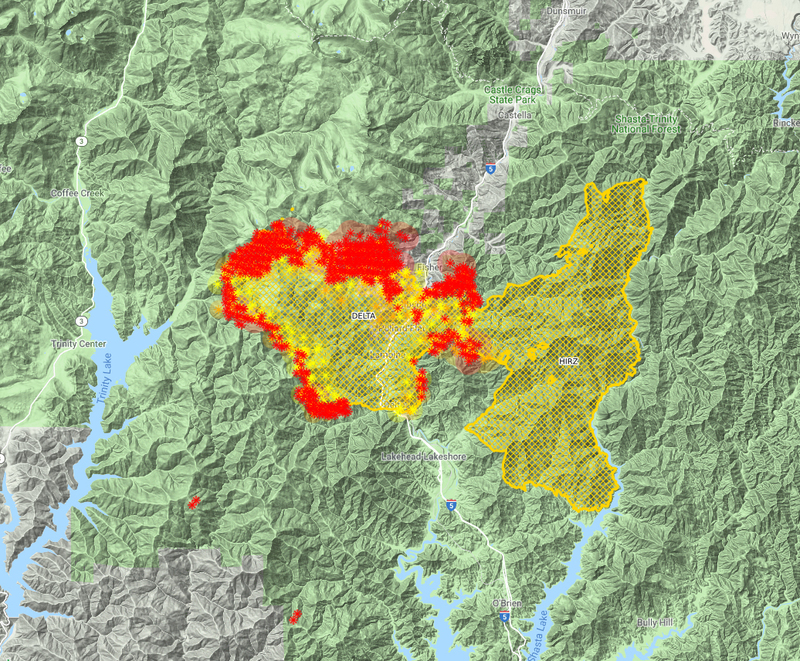 Holding the fire where it is right now will prevent the fire from advancing up the Sacramento River canyon and threatening Sims, Sweetbriar, Castella and Dunsmuir. I reckon this is where a lot of resources are being thrown into the fray. 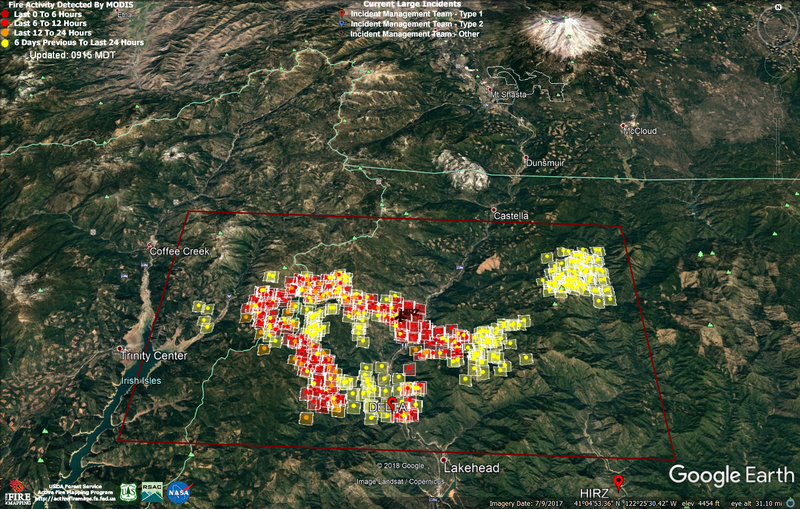 The above map gives a broader picture of some of the firefighting operations that are currently ongoing. 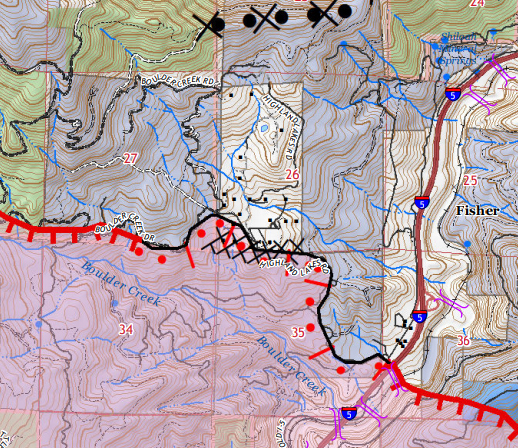 There is already a usable fire line cut along Middle Ridge. I believe that back burning operations have already begun there. Not only does this help hold back the fire from heading toward more populated areas, it also helps defend natural places like Tamarack Lake. The rest of the ridge running to west is still vulnerable. Hopefully this is the next area targeted for attack. We’ll have to see what the fire does tonight before being able to guess what the next stage of containing the Delta Fire looks like. I think there is some factors that give some flickers of optimism at this time. Nonetheless, the situation is still very fluid and the whole effort could go sideways. Let us pray that proves not to be the case. 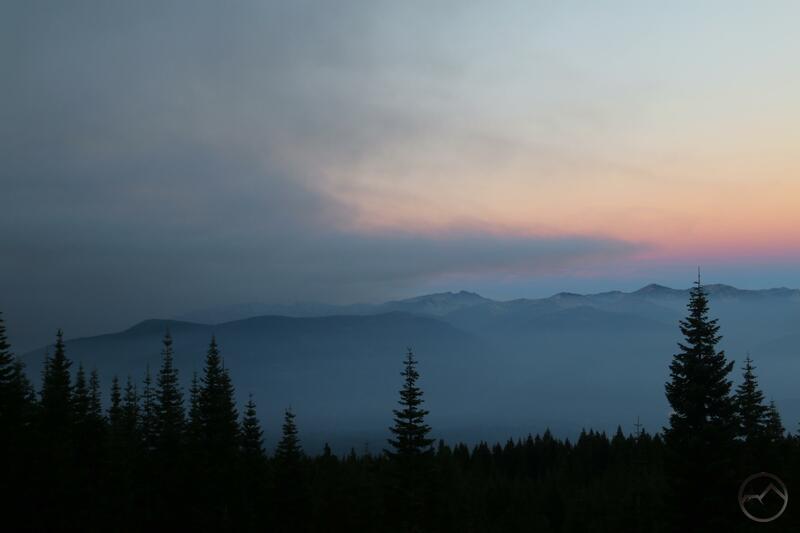 The sun rises through smoke that covers the region east of Mount Shasta. Today is the fourth day of the Delta Fire. While the fire began with a roar on Wednesday, it seems like its advance has slowed, though it is still out of control and very dangerous. This morning it has heated up again and is moving north. From there I headed north, to watch the sun come up behind the mountain. With the smoke drifting to the northeast, the morning provided a the unusual spectacle of watching the sun with the naked eye, as it was filtered by the smoke. 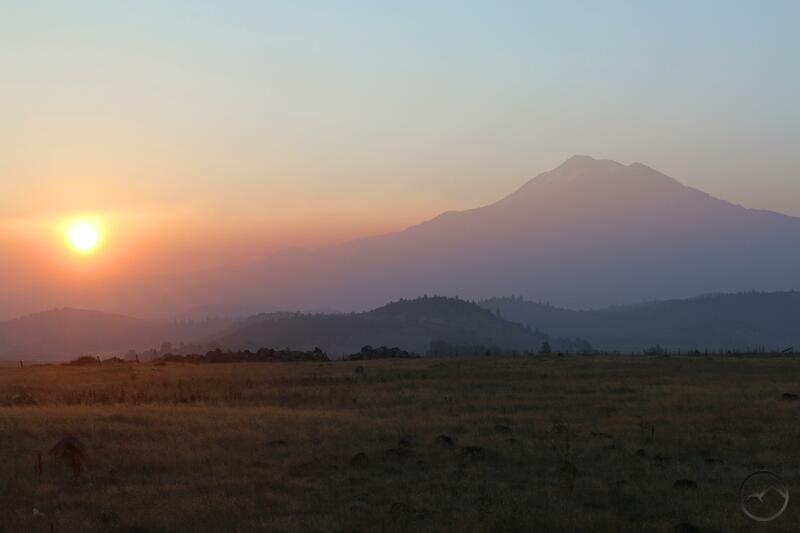 Also unusual was the smoke passing through the gap between Mount Shasta’s summit and Shastina. The smoke seemed to flow faster through the gap, pushed by the strong wind currents that are typical of that spot. I watched the plume as it billowed and roiled and thought it almost looked as though fresh snow were being blown off the mountain as the sun was coming up. Would that it were so. The smoke may present some unusual photographic opportunities but at this point I would dispense with them for a dead fire and clear skies. Before I go into what the fire is up to, I want to reiterate that all the analysis is my own and that I am a complete amateur at this. Firefighting personnel know far more than I! So what is going on with the fire this morning? 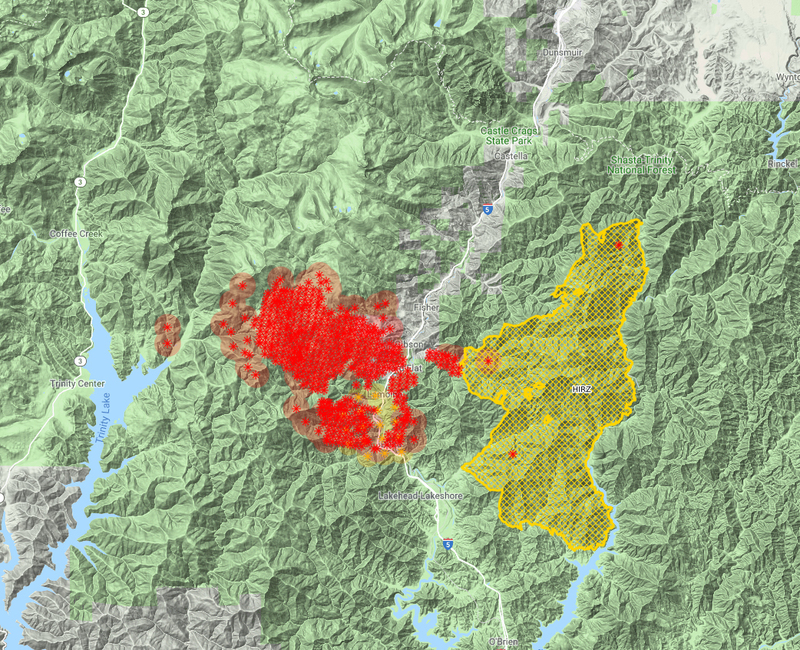 Frustratingly, it has now grown to 37,000 acres, nearly equaling the neighboring (and now contiguous) Hirz Fire. 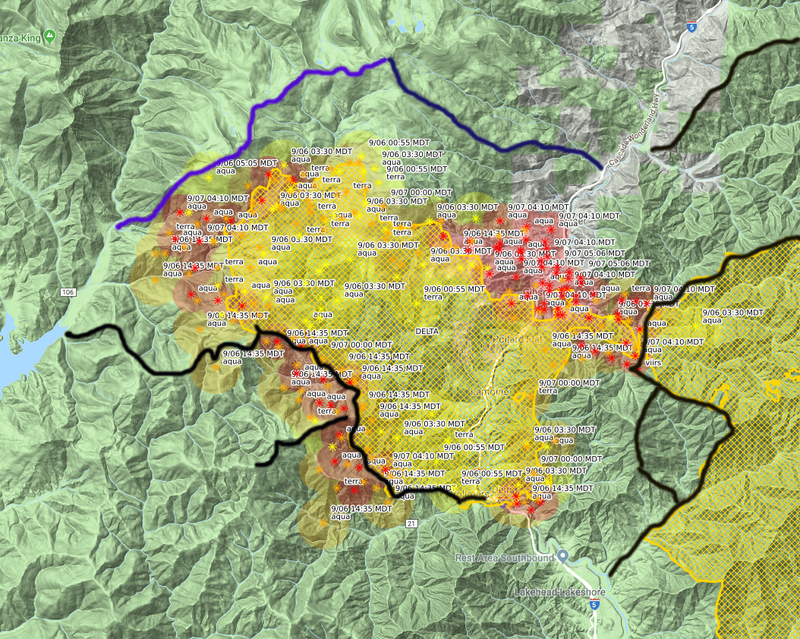 Yesterday the fire expanded a bit in the canyon, threatening to move north through the vital and vulnerable corridor. Thankfully it seems to have backed off there. However, there is renewed strength to the flames on the northern front, though it does not seem to be advancing at a rapid rate. The pair of isolated heat blooms on the northeast corner are probably backfires being conducted on Middle Ridge, where a fire line is being cut in. Hopefully that project continues swiftly and the line is able to be built all the way across the ridge and connecting to Red Mountain on the west side. This would contain the fire and also preserve the gorgeous Tamarack Lake Basin (one of my personal favorites). This map was included in an update yesterday, but I think it is worth posting again. The depiction of the fire is out of date, since it was drawn yesterday but the fire lines have not changed. I drew in the breaks built to contain the Carr and Hirz Fires, as well as the line on Middle Ridge that is under construction. I added a speculative line that I imagine is under construction or would make a good project to contain the fire’s northern advance. I imagine the fire is likely to continue to burn to the northeast, across the Sacramento River. This will consume the Hazel Creek watershed but stay contained by the contingency line built along Sweetbriar Ridge. That, along with the line being built on Middle Ridge (the dark blue line), should protect Sweetbriar, Castella, Dunsmuir and beyond. With the new day arriving and some clearish skies, I hope the air attack can really continue to hammer at the fire. That, along with the crews cutting in lines, they might be able to put a lid on this thing. Lord willing! The fire does not seem to be advancing but things are really heating up. 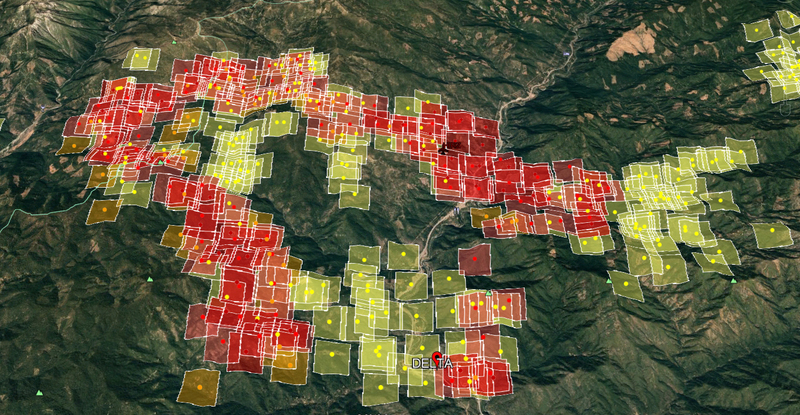 It also looks like more heat blooms on Middle Ridge may indicate backfire operations are expanding. Again, that is complete amateur speculation but it fits with what we know. The Delta Fire as of Friday morning. The two large yellow clusters on the right are from the Hirz Fire. I am going to keep things brief and direct this morning. I will update throughout the day as I see things worth adding. Read my first two posts on the Delta Fire here and here. The Delta Fire continues to burn furiously in the mountains north of Lakehead. It has grown to 24,558 acres. Though the fire does not seem to have advanced much to the north, it has expanded on the southwest and northeast corners. The former is not a significant problem, since it is likely to just burn up to contingency fire lines cut in for the Carr Fire. Unfortunately, this is not the case on the northeast side. The fire has gathered strength in the Sacramento River canyon. I hope that they can really jump on this fast. At least with the day arriving they have the opportunity to bring aerial resources into play. A closer look at the fire. 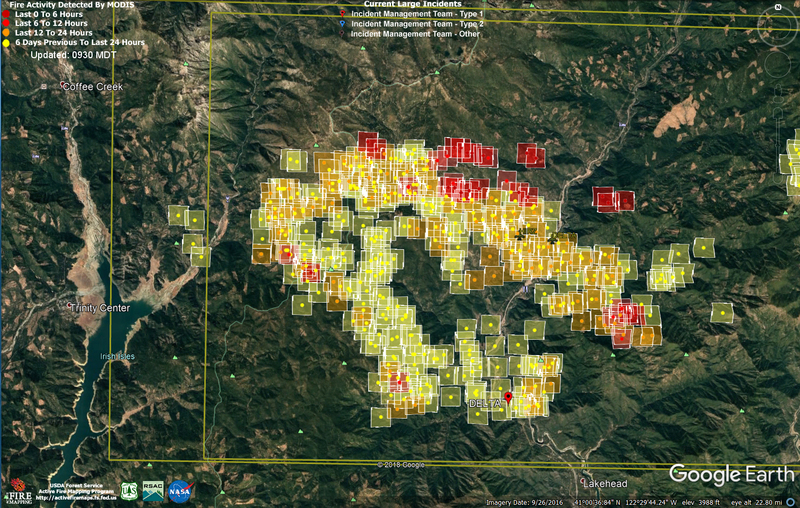 The yellow cluster at center bottom marks the initial expansion of the fire. Aside from weather conditions, I think there are two challenges (and I am just guessing here. I am no expert) facing firefighters at this time. First is the rugged conditions in the canyon. The sides are steep and tough to access in some places. The canyon also works against aerial resources. It is probably almost like having to make the trench run on the Death Star. The second problem this part of the fire poses is the presence of lots of old clear cuts. These presents the possibility of accelerated spreading of spot fires. This perspective is looking from east to west. It gives a little more sense of the ruggedness of the terrain. On the east side of the fire, the Delta Fire has linked up with the older Hirz Fire. This does function as something of a natural fire break, allowing resources to be more focused on areas of more pressing need. There are some blessings to be found here. First, the fires are now connected in more ways than one. 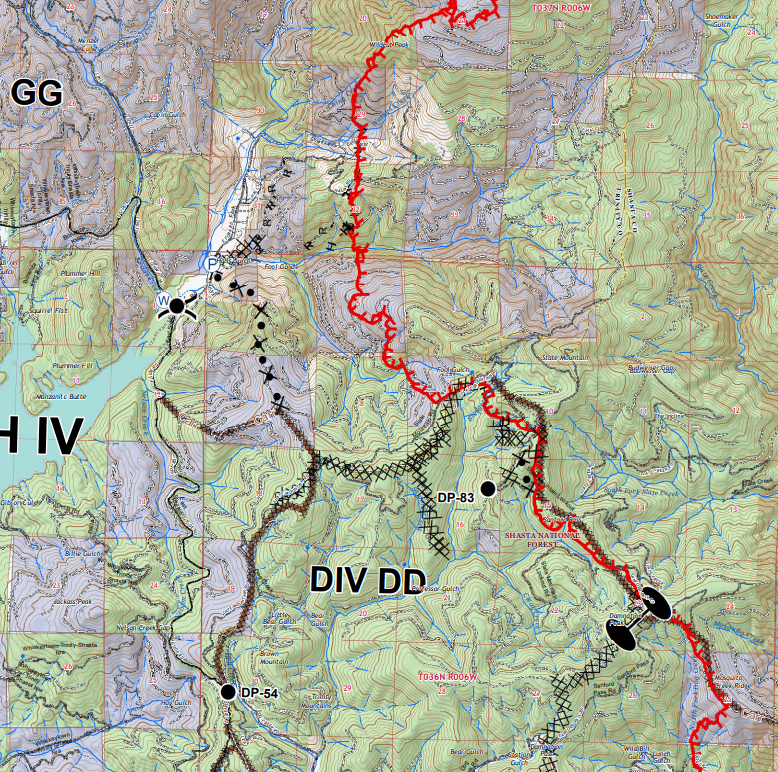 The command and resource structure of the Hirz Fire has taken over the Delta Fire. Among other things, this means that a lot of assets and firefighters are able to be allocated swiftly. If the fire keeps burning to the southwest, it may eventually close the gap with the Carr Fire. If this happens, there will be, amazingly, one long black scar running across the southeast corner of the Klamath Mountains. 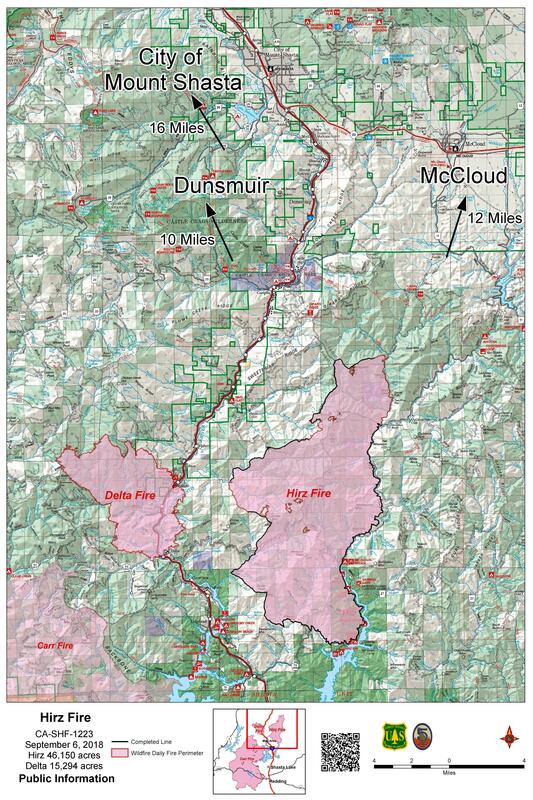 In a roughly 45 mile arc, it will stretch all the way from Igo to just southeast of Dunsmuir. That is absolutely shocking. This map is a bit out of date already, the Delta and Hirz having merged. 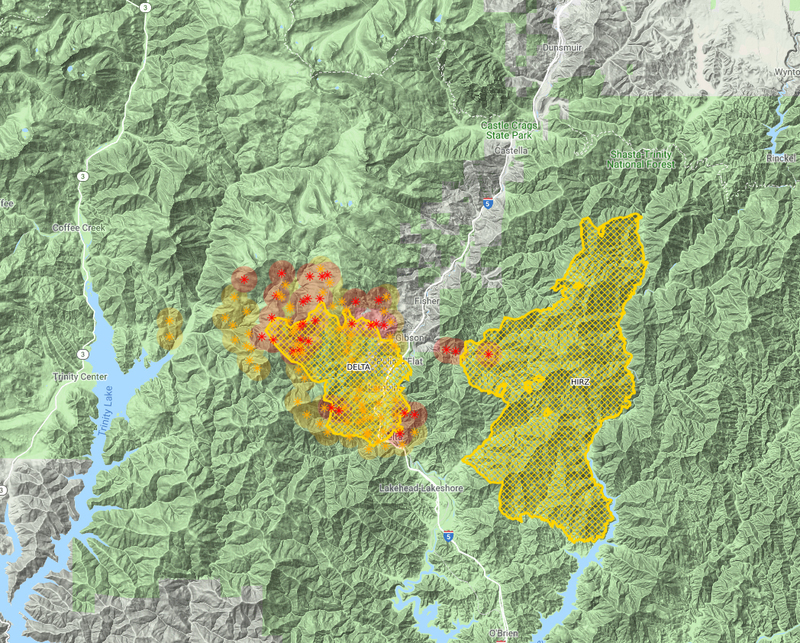 While the canyon is under dire threat, the fire has not advanced to the north much. While human geography is more important than the natural, I have been hoping that the Tamarack Lake area might be spared. While this is by no means a sure likely outcome, it has, thus far, dodged the bullet. I am hoping it continues to do so. Here is the progression of the fire throughout yesterday to this morning. Note how the intensity subsided a bit yesterday, flared up in the evening and then expanded into the canyon north of Pollard Flat. That is the really critical point of defense right now. I feel that I need to note that all of the information offered here is my own assessment of the situation and speculation. If anything proves false, I apologize and ask for correction. Let’s hope this thing gets whipped soon! Based on the current Delta Fire activity report and the already extant fire lines cut in to defend against the Carr and Hirz Fires, I think it is possible to start to get an idea on what the plan is for the Delta Fire. 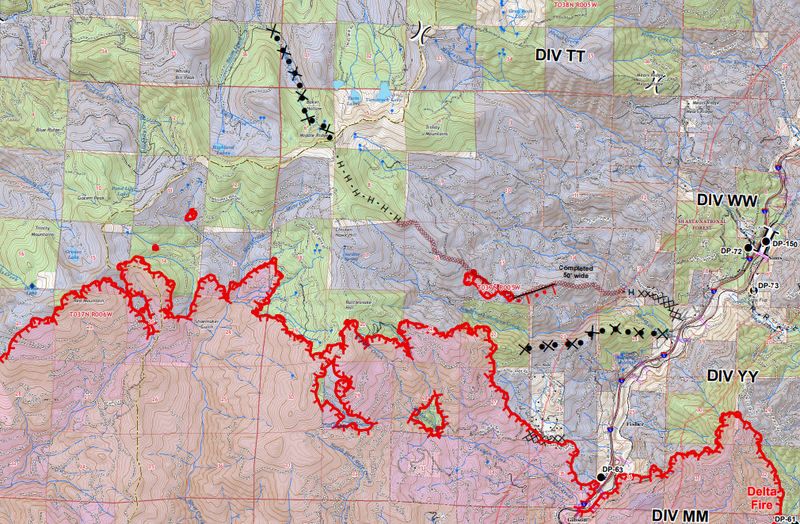 On the map above, I marked all the Carr and Hirz fire lines in black. Some of those are already in use, holding back the Delta Fire. The activity report states that bulldozers are currently cutting in a line on Middle Ridge, which runs from roughly Sims up to Baker Point, above Tamarack Lake. This is marked on the map in dark blue. I am guessing, though I have no confirmation, that they will try to hold the ridge running from Baker west toward Red Mountain and then down to the East Fork of the Trinity River. I marked this speculative line in purple. This seems like the most effective and logical place to make a stand on the northwest side of the fire. I sure hope so, otherwise a lot of place we all love to visit are exposed to the flames. Smoke from the Delta Fire obscures Black Butte. The Delta Fire started off with a bang yesterday. It quickly expanded from a few acres to 2,000 acres to 5,000 acres and then, during the night, exceeded 15,000 acres. As of the time of this writing, (about 9:00 AM) I would bet it is approaching 20,000+ acres. Unfortunately it is officially at 0% containment. The weather is going to be warm today with dangerous conditions returning again in the afternoon. I am praying for the firefighters and that they can put a lid on this thing really quick. 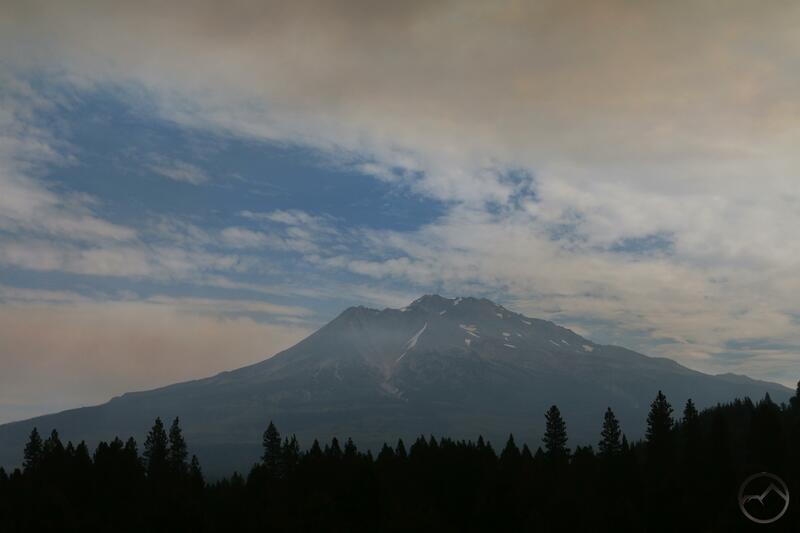 Here in Mount Shasta, the conditions are smoky and ash continues to fall out of the sky. I was up last night around 3:00 AM and the ash was reminiscent of snow. Would that it were. 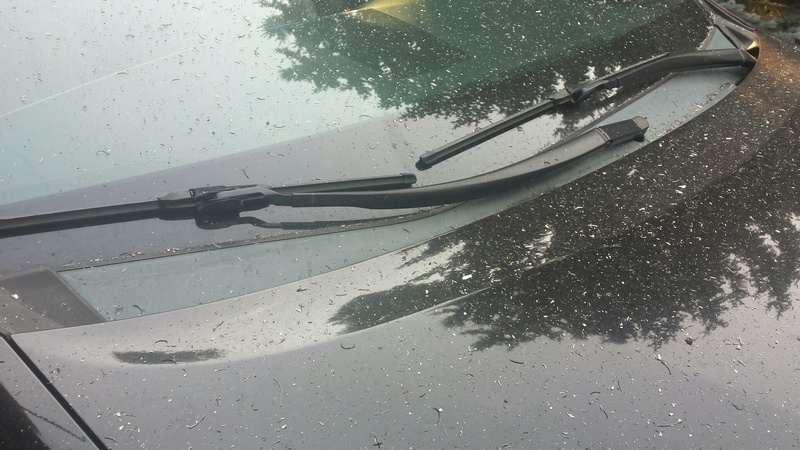 When it was light out I checked the conditions outside again and there was ash everywhere. Some schools have been canceled for the day, though I imagine that this move was done largely to keep people off the freeway and roads. Evacuations are in effect as well, stretching from Lakehead all the way to the Shasta County line. South Dunsmuir has also been evacuated, but I am guessing that this is referring to the area that lies immediately on the county line, near Railroad Park. 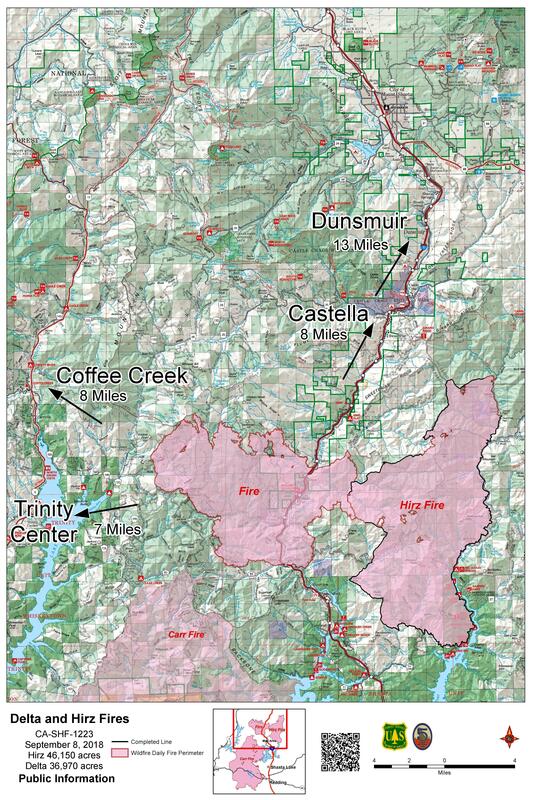 This includes Castella, Sweetbriar and the Soda Creek area. So what is going on with the fire itself? To catch up, check out my post from last night. It has been updated with some night time webcam images. See the live map here. The last image, being the most recent, is obviously the most pertinent and shows just how intense the fire is. Unfortunately the flames are encroaching toward the Tamarack Lake Basin, one of my favorite spots in the Trinity Divide. I really hope that area manages to escape the flames. It may be that this fire erases the last bits of the Trinity Summit Trail too. Sad. I do think there is a little good news in all of this. Ironically, the fire is burning right in between the north end of the Carr Fire and the Hirz Fire. This means a couple of things. First the previous fires have significantly reduced the fuels in those areas, making them somewhat natural fire breaks. Second, there were contingency bulldozer-cut fire breaks that were cut in to contain those fires if the lines that ultimately stopped the flames failed. This is particularly useful on the southwest side of the Delta Fire. 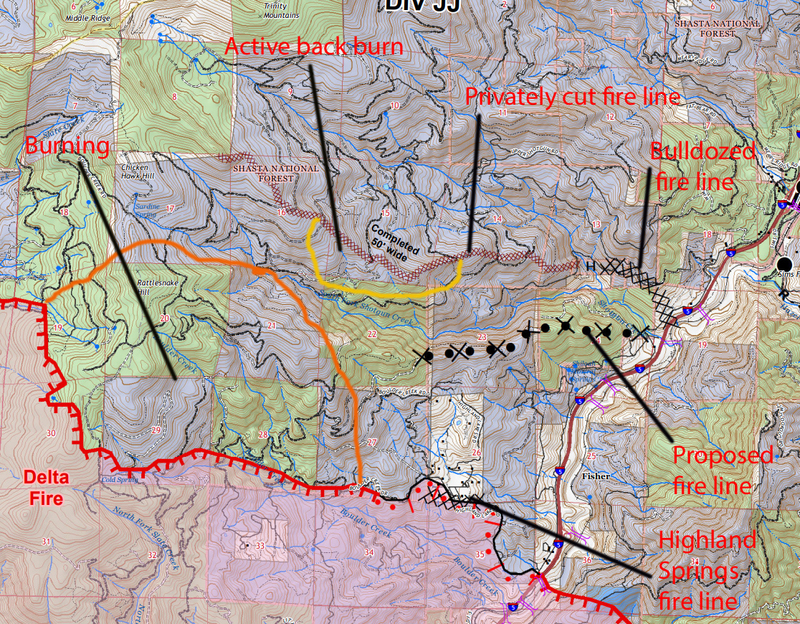 On the map, those lines are what have prevented the fire from advancing on Lakehead. 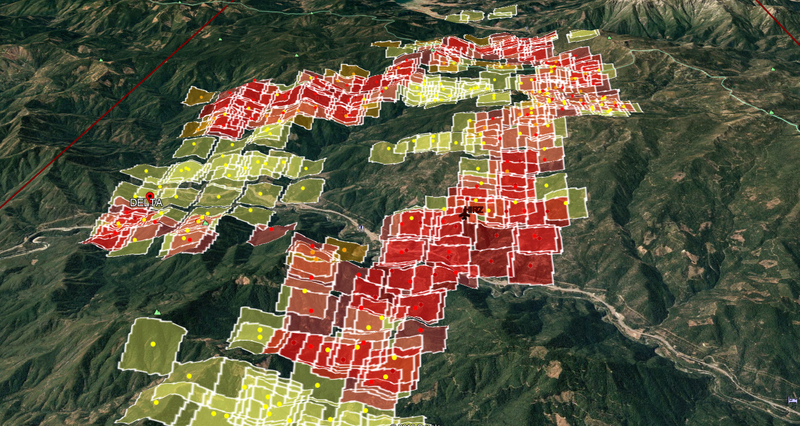 Map made by Deer Creek Resources. The white lines indicate contingency fire lines already in place. Another good bit of news (this is unconfirmed by a second source) is the small heat blooms visible next to Trinity Lake. These have been reported to be backfires already begun to block the the westward advance of the fire. North of this back fire area is Bonanza King. 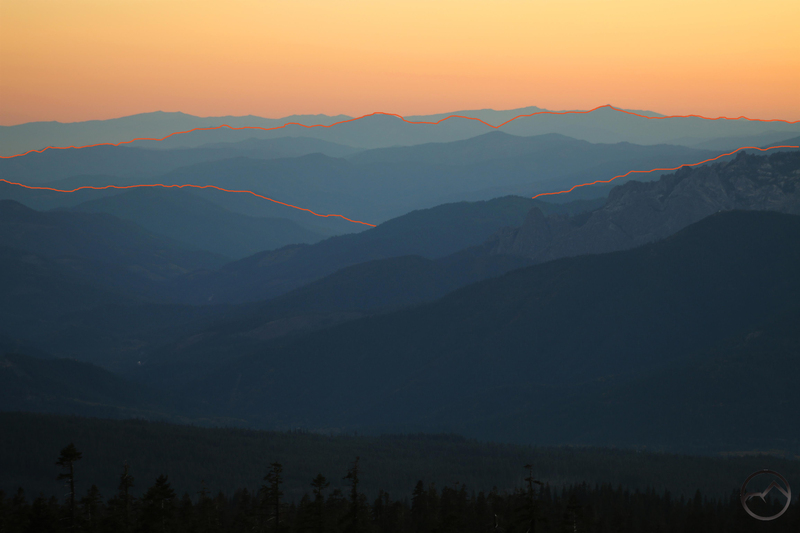 This is the largest mountain between the Trinity Divide and the Trinity Alps. At 7,000 feet and very rocky, it may serve as a natural fire break on the west. The north end of the Slate Creek watershed is made up of Middle Ridge, which also hems in the Tamarack Lake Basin. This would be a good place to stop the fire’s northward advance, if they are able to hold that area. The other really troubling spot is the west side of the Sacramento River Canyon. It has a lot of clear cuts and those are easy places for spot fires to start. Today is critical in containing this fire and I believe that significant resources have been diverted to fight the fire. Hopefully that is the case. I’ll be saying prayers all day. I hope everyone else is too. Also, I have heard that the gas station at Pollard Flat survived. Let’s hope that is the case! The Delta Fire at 10:45 AM. The scanners indicate significant air resources are being diverted to the Delta Fire. This certainly is a good thing. 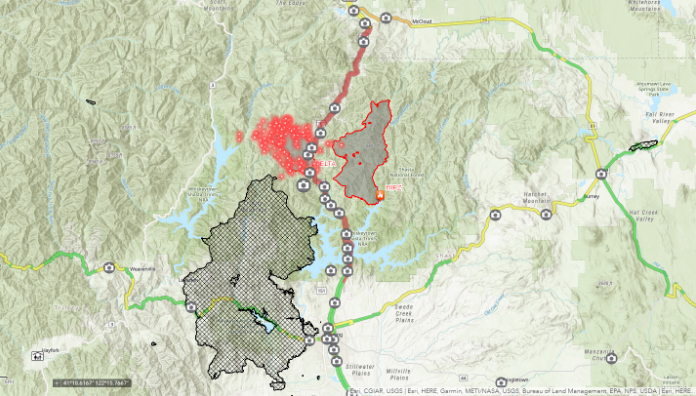 If the contingency lines left over from the Carr Fire hold and and the fire around North Salt Creek can be channeled into the Hirz Fire, then the northern area is the most pressing area of need. Perhaps much of the air resources will be used to bottle the fire up, especially along Middle Ridge. That is the most obvious natural line of defense and I hope they hare able to make a stand there. The smoke has really shifted to the west since this morning. 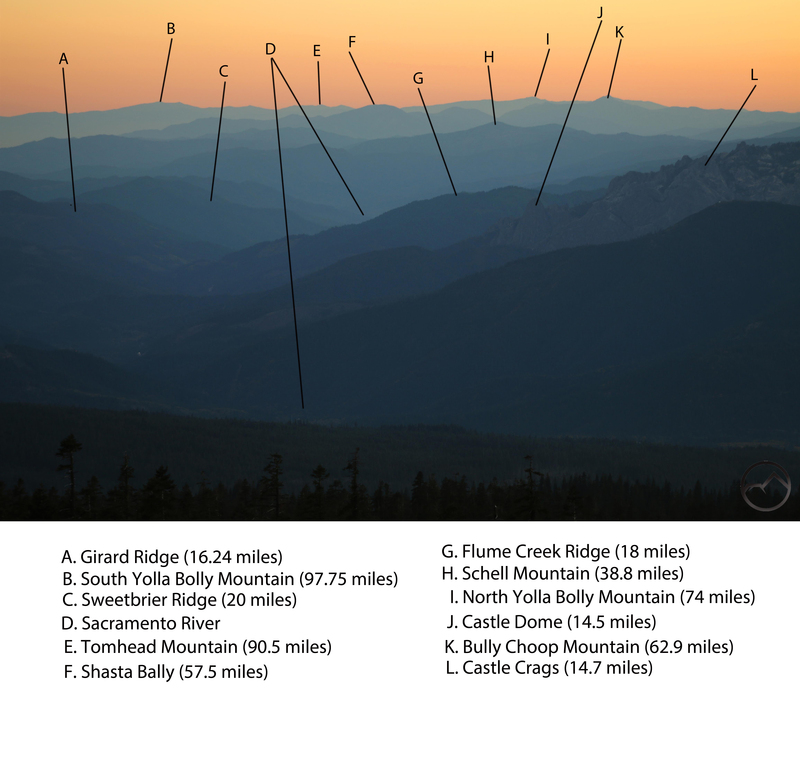 The Trinity Divide is really socked in but Mount Shasta is relatively smoke free. It sort of feels like rain but none is in the forecast. It all feels very strange. 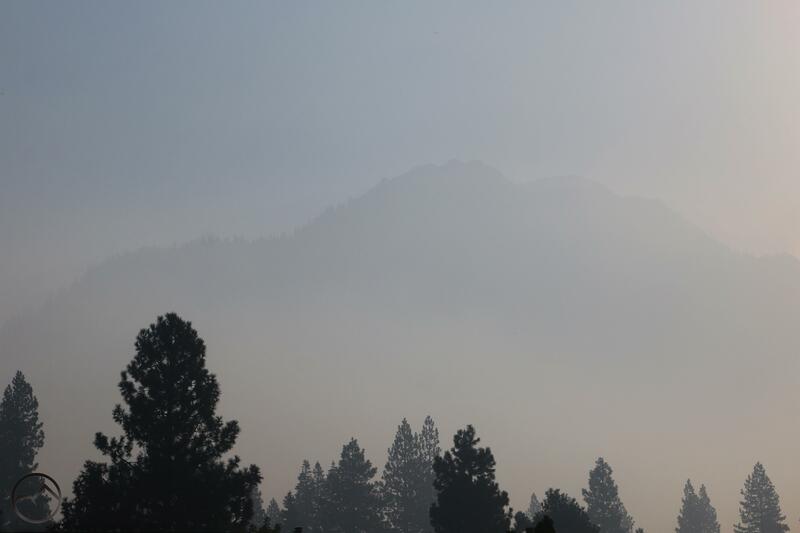 Smoke has inundated Mount Eddy and the Trinity Divide. Mount Shasta is surprisingly smoke free. The heat blooms on this map make it look like the fire is losing its intensity. I am sure that this is not the case, but it does give some cause to hope that perhaps they can close the door on this really fast. I suspect that there will be an update soon indicating the fire’s actual, and likely substantial, activity. Also, if you are trying to get around the fire watch out for big rigs on both Highway 3 and on Highway 299. Hwy 3 was blocked by a big rig last night and 299 is currently blocked by an accident involving a big rig.